A couple of us from the Woodlore offices took some time out to visit the Traditional Living Skills course last week to see how everyone was getting on. This is a brand new course for Woodlore which has been designed as a ‘next step’ from the Fundamental. The Traditional Living Skills course is aimed at teaching you how to live comfortably in the forest with minimal equipment. 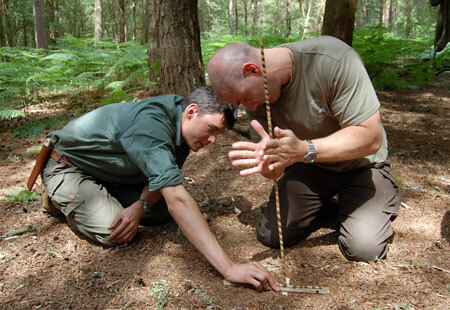 After a quick catch up with the field staff, Dan Hume and Tom Seward gave us a quick lesson on one of the techniques taught on this course – the hand drill method of fire lighting. Both Tom and Dan managed to make it look far easier than it really is! We both gave it a go, getting smoke before our arms seized up just short of an ember… It’s easy to see just how addictive this method can be. We then joined the group as they were given a demonstration on traditional net making methods, using a hand-carved wooden needle. The clients had been carving their own needles during the week, so after the tutorial they all got to work trying it themselves. We left the camp at this point and took a tour of the course site, visiting each of the 4-man shelters that the students had made earlier in the week in their groups. As you can imagine, a 4-man shelter needs to be a fair size, so building one that will keep you sheltered from the wind and rain is no mean feat. In the end though, none of the shelters had to go through that test, as the great weather continued all week. 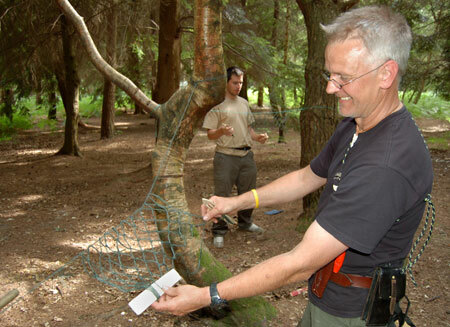 When we returned to camp, the group had made some excellent progress on their nets. We were really impressed to see how quickly they had picked the technique up, and everyone seemed very content to be sitting in the shade of the trees, working away on the task at hand. Thanks to all the staff and students of last week’s course for what was a really enjoyable afternoon and a great insight to what happens on this new course. 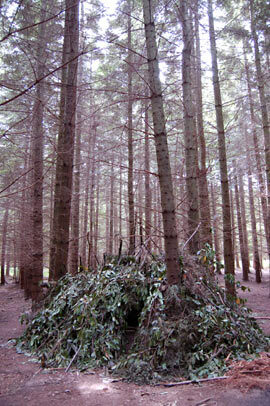 This entry was posted in Bushcraft Courses & Expeditions on July 6, 2010 by Woodlore Team. This was an incredibly well-conceived course. We learned a good diversity of new skills that knitted together perfectly. Yes, with a bit more practise, I do feel more confident in living comfortably in the woodland with just a knife. That’s a great feeling! Thanks Paul, James, Dan and Tom.